I'm on a course this week and was a little disappointed that it meant that I wouldn't make it to the second meeting of the Bath Clandestine Cake Club for logistical reasons. The theme this month was 'Alcoholic Cakes' and I'd been planning on making a Pimm's bundt cake. After pondering the best way to deliver all of the fruit flavours associated with Pimm's, I found a fabulous idea on the Skin and Blister blog, where the bundt was drizzled with Pimm's and sugar and then had little sticks of fruit, artfully arranged on the outside. When I finally realised I wouldn't be able to make it to CCC (last night, when my usual journey of forty minutes, took an hour and forty! ), I decided I'd save the bundt for my cousin's rather fabulous Wedding Festival Bake Off and not bake at all this week. Depending on how you look at things fortunately (or unfortunately), my course colleagues kind of talked me into baking tonight anyway. You know when you go on a course and they do that really annoying thing at the start where you tell everyone who you are and then one random fact about yourself? Well for once, I had something interesting to say. I told them about my blog. It sparked a discussion over lunch as to whether I was actually cooking 'real food' or was doing 'beans on toast', 'beans under toast', beans with toast on the side', 'cheesy beans on toast'.... Thankfully, because I've blogged every night and for all apart from about two posts, I've managed to get at least one picture of the results (didn't think about doing it for the very first post, and one disaster went straight in the bin as I was so p'd off with it), I was able to direct them to the blog so they could explore for themselves. This lunchtime, I got asked what was for tea last night. I was secretly pleased that the ones staying at the local 4* hotel said that my dinner sounded better than what they'd had. And then talk turned to what today's recipe was. Because I'd already spoken about my love for baking and how my normal colleagues have been the recipient of many a cake, I kind of felt duty bound to do my usual Tuesday night activity of baking for work. 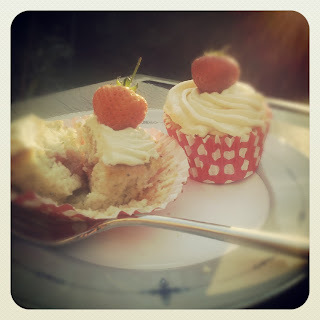 And so the Pimm's cupcake was born. I had done a little research on this last night and was disappointed with the lack of inspiring recipes. There's even one on the Good Food Channel website that has cucumber buttercream. That's a step to far for me! With this in mind, I set about creating my own recipe which I'll share with you tonight. I'm not saying it's perfect. I think they're okay. There's probably room for improvement. I think they're lacking something, but I'm not quite sure what. So if you want to try the recipe and tweak it, let me know what you did and how it turned out! 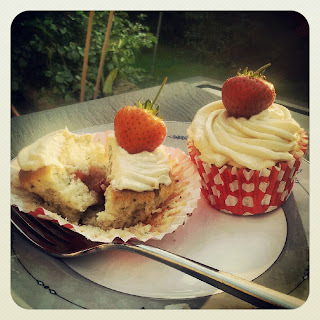 I used the Hummingbird Vanilla Cupcake as a base as I was looking for a light airy bake. A while back, I made their Mojito cupcakes for work, but because I was making bigger cakes this time and needed 14 of them, the vanilla recipe worked better with a slight adaptation. For the filling, I reduced some Pimm's, orange juice and sugar and then added in halved strawberries and left them to cool. The buttercream was laced with Pimm's, orange, lemon and lime zest. I did a bit of research on this yesterday and found that the lovely Jacqueline over at Cake Boule had made Pimm's and strawberry buttercream for her gorgeous truffles. I was pleased with her tip that she tweeted me that it makes a soft buttercream as I wasn't so worried when it came time to pipe it. No big Wilton 1M swirls on these little beauties! 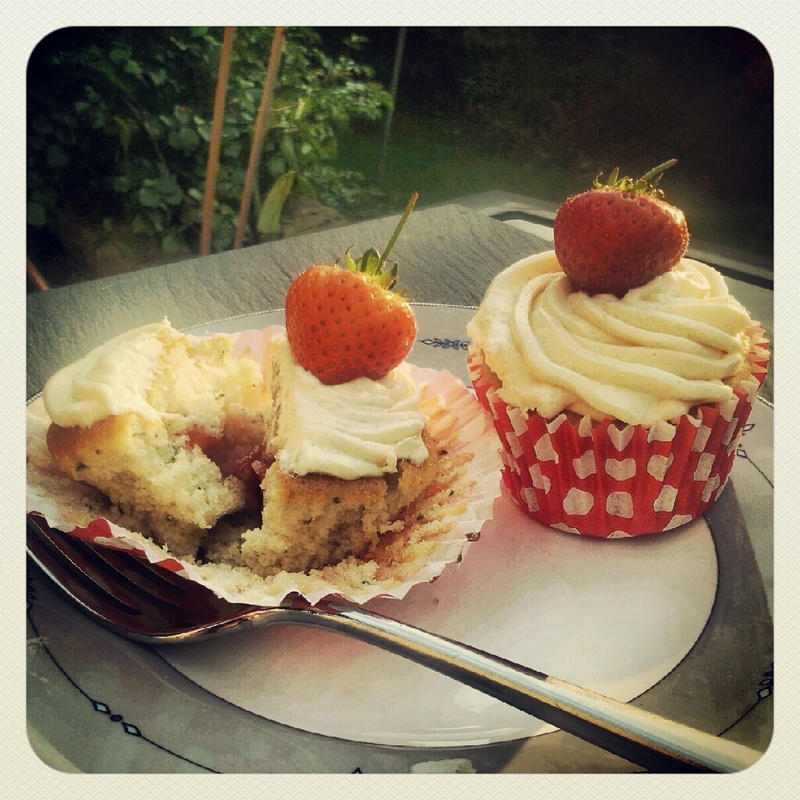 Again, if that's what you like, tinker with the buttercream recipe until your happy with the consistency. I've tried one, purely for the purposes of telling you how it came out. The rest are piped and now chilling in the fridge in my cake carrier, ready for a trip to the office tomorrow. There was a small bowl of buttercream left to, so I'll be interested to prod it in the morning and see if it's set or not. I'll update tomorrow with feedback from my colleagues. Of course the trouble is that we have a 'Learning Contract' that we wrote on Day #1. Amongst many things, it states that we are not allowed to criticise others. Any rule flouting incurs a £1 fine. So far, we've collected £7 (of which I contributed one for answering the phone to my boss). So I'm sure they'll say the cakes taste amazing even if they don't really think so. Preheat the oven to 190c/170c fan/325F. 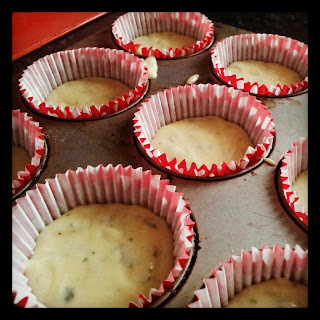 Line two muffin tins with paper muffin cases. 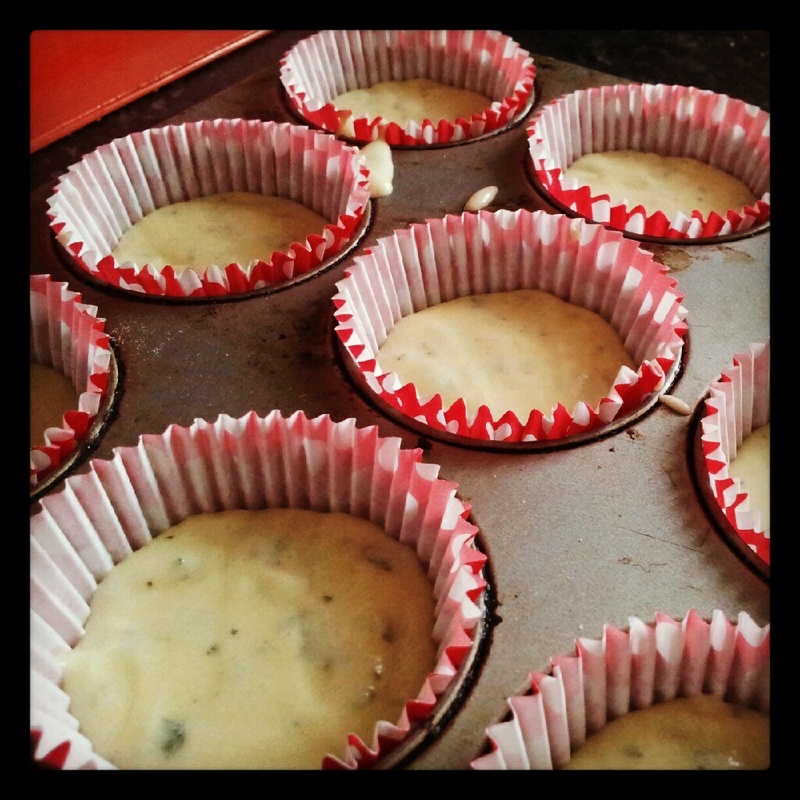 If you only have one muffin tin, you can always bake in two batches. Put the flour, sugar, baking powder, salt and butter into a bowl and, using an electric mixer, beat on a slow speed until it resembles breadcrumbs. Mix the eggs, milk and mint in a jug. Pour half of the milk mixture into the flour mixture and beat slowly until combined. Scrape down the sides, add the rest of the milk mixture and then beat until you have a smooth batter. Beat in the lemon juice. Divide the mixture between the cake cases, filling them half full. Bake for 18-20 minutes, then remove from the oven and place on a wire rack to cool. Meanwhile make the strawberry filling by placing the Pimm's, sugar and orange juice into a small pan. Bring to the boil and then simmer until the liquid has reduced by about a half. Remove from the heat and add in the strawberries. Toss to coat and then leave to cool. When the cakes are cooled, carefully cut a small cone shape from the top of each cake - keep the cut outs, don't eat them! Fill the hole in each cake with a couple of pieces of the strawberry and then replace the piece of cake you removed. Make the frosting by beating the icing sugar, butter and salt together using an electric mixer until it resembles fine breadcrumbs. Add the fruit zest, and continue beating. Slowly pour in the Pimm's. Beat until light and fluffy then spoon or pipe some onto the top of each cake, ensuring that the cuts in the top of the cake are covered. Finally top with a whole fresh strawberry. Or if you're feeling extravagant/arty, use fresh mint leaves and twists of orange, lemon, lime and cucumber skin cut with a cannoli cutter.